We are hiring for Associate Stylist positions. If you are interested feel free to fill out our career form below. ​​If you are looking for a professional, career focused salon culture that prioritizes education, excellence and client experience – then we are looking for YOU. Salon Herdis is hiring new and experienced stylists, estheticians and guest service experts. We are a Summit Salon that provides an exciting career path for service providers looking to grow faster, better and STRONGER! 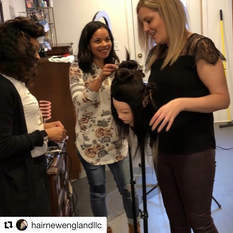 Whether you are new to the industry or have years of experience but just feel stuck – Salon Herdis offers the systems, coaching and education needed to take your career to the next level. Our full-time paid internship program is designed for recent graduates in cosmetology and esthetics. During your time in the program you will learn how to provide a premium client experience by working HANDS-ON with one of our incredible educators. This one-to-one coaching and mentoring program will provide you with an incredible advantage when starting your career. Full time associates earn up to $30K per year, and have access to world-class technical classes and nationally renowned educators. In addition to the one-to-one coaching, associates also have weekly opportunity days to work on their own clientele and practice their skills. Feeling stuck in a dead end job? Salon Herdis wants to meet you. We work with stylists and barbers at every level to give your career a new life. You will have the opportunity to earn as a commission service provider while also benefiting from one-to-one coaching with a Salon Herdis educator. This unique on-boarding process has a proven track record in our company. We know that it is hard to find the right fit, and we are eager to provide a professional, supportive environment for you while you write a new chapter in your career. Guest Service Experts are responsible for maintaining the salon front of house. This includes first and foremost, giving our clientele a seamless, friendly experience both in person and on the phone. You will be thoroughly trained to offer our guests additional service opportunities and at-home care. With competitive wages and bonus opportunities (and a beauty budget! ), Shi-Shi's Lounge is the perfect place to start a career in the beauty industry. If you would like to tour Shi-Shi's Lounge and speak to a staff member about opportunities with our salon company, please call us at 508-304-7870 or email Eurayshia Williams Reed at shishislounge@yahoo.com. To apply for any of our career opportunities, please take a moment to complete the questionnaire below. A Shi-Shi's Lounge representative will follow up with you via phone.